PB & J Granola | What Smells So Good? Peanut butter and jelly is definitely a timeless classic. Whether you go the Skippy and Smucker's on Wonder Bread route or favour homemade spreads and loaves, it's a quintessential comfort food for not only children but their parents too. I used to eat PB&J for breakfast or as a snack, slathering on the creamy peanut butter and tart cherry jam before folding the pieces in half for a double-thick treat, and my family still defaults to the combination when we're pressed for time, ingredients and inspiration. Today, our sandwiches are really a combination of storebought peanut butter and homemade jams and bread, and this granola that I adapted from the blog Peanut Butter Fingers is no different in combining its elements. With a fabulous crunchy peanut butter sweetened with honey and a generous spoonful of homemade jam, the whole shebang toasts to perfection - no extra oil necessary! While it's easily doubled or tripled, I made a small batch of this because, knowing me, the 1/4 cup serving size would soon turn into a 1 cup portion! As it is, the addictive mixture is not only a unique twist on breakfast, but is a fantastic topper for ice cream, a base for yogurt parfaits, a delightful crunchy topping for baked apples and even the secret ingredient in our "new" versions of peanut butter and jelly sandwiches*! Combine peanut butter, honey and jam in a large bowl and microwave about 20 seconds, until the peanut butter melts. Add cinnamon, nutmeg, vanilla, oats and wheat germ and stir until oats are completely covered in peanut butter mixture. 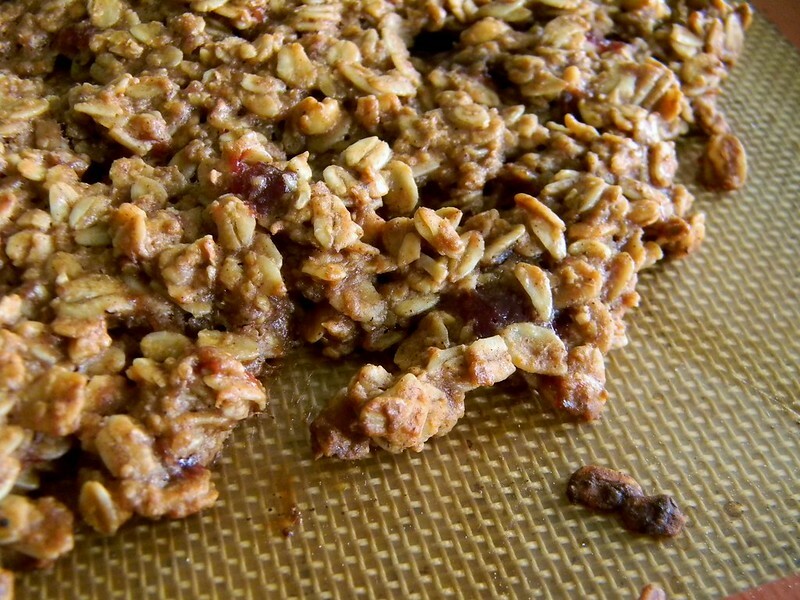 Spread out oat mixture onto the sheet and bake for 25 minutes. Turn off the oven and allow granola to cool inside. *If you want to give "my" PB&J version a go, spread a hearty whole wheat or oatmeal bread with a thick layer of smooth peanut butter and sprinkle with granola. Spread a second slice with (preferably) homemade jam or jelly and sandwich the two!